Los Mangos Tasting & Talk Tour! 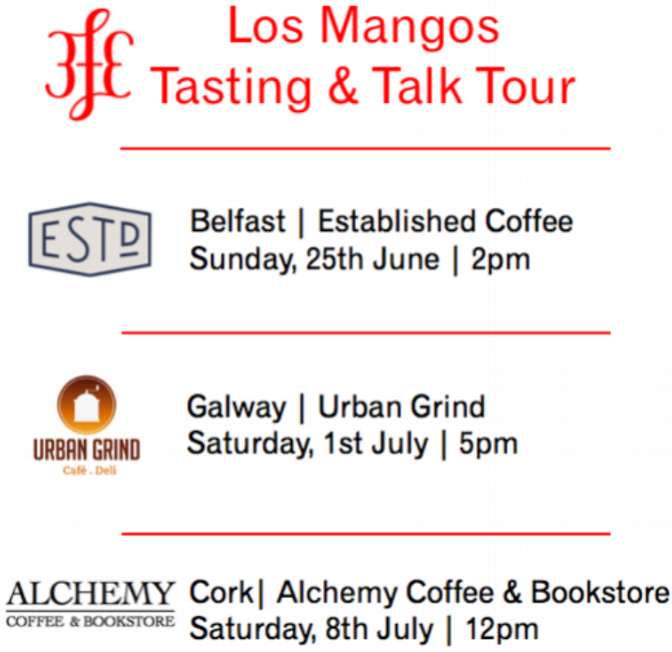 We had such a great day at our Los Mangos event last week, so we have decided to share this fantastic coffee with some of our friends and followers around Ireland, by taking the Los Mangos Tasting & Talk on tour to a number of great cafes, for the official #Losmangosworldtour! We are kicking off tomorrow with our friends in Established Coffee, Belfast. Tickets to our Belfast stint are very limited, so book your ticket to this event here. This event is showcasing a truly unique coffee named Los Mangos, from a farm named Finca Argentina, grown high on the Apaneca-Ilamatepec Mountain Ranges, in El Salvador. What makes this event so interesting, is that we will be tasting one coffee, but with three different processing methods; washed, pulp natural and natural, which has everyone at 3fe very excited! Following on from Belfast, we will be touring the talk and tasting to both Galway and Cork, with guest speakers from 3fe, including Monika Palova (Roaster) and Robyn Butler (Executive Barista) who will be filling us in on some fascinating information, all about the farm; Finca Argentina, the farm owner; Alejandro, and what really makes this coffee so special. As this years harvest is a World Exclusive for 3fe, and we have such a small amount, guests will be some of the only people worldwide to taste this years harvest of this unique coffee, with all participants given the opportunity to purchase bags of the coffee, and as there is extremely limited stock, this is a special treat!